Last week, I bought Apple’s 15-inch PowerBook, marking my most-recent switch back to the Mac. The decision, nearly five years to the day after buying my first PowerBook, marked the final chapter in my back-and-forth switch between Macs and Windows. I’m a Mac user now, although Windows will remain vitally important for work. My struggle ensued, in part, because of Microsoft’s success at creating, for non-Windows users, barriers to entry—to the Internet and key software categories. I also wobbled back and forth because of concerns using a Mac would hurt my work, first as a reporter and later an analyst covering Microsoft. While the allure of the iMac’s unique design initially wooed me, it was Apple’s operating system that hooked me on Macs. At the time, Microsoft offered consumers the wobbly Windows 98 and for businesses Windows NT. Windows 98 supported all the newest hardware and software, but quaked under the weight of too many applications running at one time. Windows NT, by contrast, offered industrial-strength stability, but, comparatively, supported a small number of applications or devices. Mac OS 8.5, by contrast, offered a nice middle ground. Stability fell in-between the two major versions of Windows, and the Mac operating system supported devices and applications galore. I soon found working on the Mac boosted productivity, and I enjoyed using the computer more than a Windows PC. While media and marketing attention focused on iMac’s curvy exterior, I found the real gem—the operating system—to be within. By February 1999, I was ready for an upgrade. I ordered a refurbished PowerBook G3, with 266Mhz PowerPC processor and DVD drive, from PC Connection. (That computer later found a good home with a college student.) The PowerBook served up a wow experience I had never believed possible from any portable. In fact, I watched my first DVD movie on that PowerBook. My daughter inherited the iMac, which ergonomics were perfect for her. The bonus: More than 90-percent of her educational games worked on Mac OS 8.5 and later 9.x. A year later, I started to rethink my switch—and I used PCs throughout the period anyway. My day job, writing news stories about major PC companies, required my working with Windows desktop and notebook computers. In February 2000, Microsoft released Windows 2000, which combined much of Windows 98’s and successor Windows Me’s application compatibility with the stability of Windows NT—almost. So I put aside the Macs and for a while used a Windows 2000 PC, but a short-term loaner from a computer company. My daughter continued to use the iMac, in fact, a newer, faster model with a DVD drive. While Microsoft had made great compatibility strides with Windows 2000, many kids’ games choked or didn’t run at all on the OS. My daughter continued to use iMacs and, for a while, the Cube during this period, but with increasing complaint. Microsoft’s strategy of wooing developers to Windows-only development tools, such as DirectX, meant fewer games would run on both PCs and Macs. At the same time, while Microsoft’s antitrust case raged forward, cruising the Internet grew increasingly difficult for people using non-Windows operating systems. Remember, trustbusters accused Microsoft of using anticompetitive means to maintain its OS monopoly, particularly with respect to Netscape Communications during the so-called browser wars. March 2001 marked major crisis points, as my Mac or PC debate intensified. That month, Apple released the promising but woefully lacking Mac OS X. About the same time, I started receiving leaked copies of Windows XP, Microsoft’s successor to Windows Me and Windows 2000. Without question, Mac OS X performed more smoothly than early Windows XP builds. I also preferred OS X’s Aqua interface to XP’s Luna. But Apple shipped OS X without support for CD-RW and DVD drives, among other shortcomings. But I gave OS X a fair shake, even though some of my Apple news stories harping on OS X’s faults churned up more PC-bias hate mail from Mac enthusiasts. For two months, I used OS X fulltime and without using any Microsoft software either. I wrote stories in AppleWorks. But OS X’s shortcomings, a paltry offering of native applications, and the lure of Windows XP brought me back to the PC throughout summer 2001. I ran various leaked version of Windows XP during this period, which also marked the beginning of my tenure as CNET News.com’s reporter covering Microsoft. After receiving final code for Windows XP, which is unquestionably the best operating system released by Microsoft, I again started to pine for Mac OS X. By the end of September 2001, Apple had released Mac OS X 10.1, which fixed many of the problems afflicting the original release and opened the floodgates of new applications. October 2001 marked another crisis point, as I grappled with whether OS X 10.1 or XP would be my operating system of choice. For some strange reason, the crisis came to a head with an invitation to join about a dozen other reporters for dinner with Microsoft Chairman Bill Gates on the eve of Windows XP’s launch. After much deliberation, I declined the invitation and the opportunity to travel to New York for the October 25 launch event. That same day, I switched back to the Mac. As much as I liked Windows XP, I enjoyed using Mac OS X 10.1 more. My Mac love affair held fast with some PC regression for reporting purposes until late January 2002. As much as I liked Macs, I found my reporting on Microsoft improved whenever I used PCs. So, in February, I decided to relaunch my joewilcox.com website. I moved hosting to Microsoft’s bCentral and started publishing the site using FrontPage 10 (a.k.a. 2002). This marked a deliberate attempt to put Macs aside and move back into the Windows world I had known before that fateful December day when I impulsively bought an iMac. But Apple’s 15-inch flat-panel iMac lured me back. From March to late August 2002, I returned to the Mac full time, although I used PCs for reporting purposes. Throughout the latter chunk of this period, I used various leaked versions of Mac OS X 10.2, which Apple officially released at the end of August. I also continued publishing this website using FrontPage, which is only available for Windows. In mid-August 2002, just days before OS X 10.2’s official release, I once again put the Macs aside, choosing to work fulltime on Toshiba’s bulky but powerful Satellite 1955-S801 notebook. This choice came after another Mac or PC crisis, because I liked OS X 10.2, or Jaguar, so much. In a way, returning to Windows XP was a liberating experience. Using the OS improved my Microsoft reporting, as Mac matters no longer distracted my attention. Besides, I could more thoroughly test Microsoft software. I also found the Internet to be a friendlier place for Windows users. Many websites looked better in Internet Explorer for Windows than any Mac browser, including Microsoft’s. Not surprisingly, Microsoft offered many browsing extras tied to Windows XP or Office XP. With the switch back to Windows XP, I hoped to put an end to my divided user household. My third grader had long abandoned the Mac, even though she used Apple computers at school. The problems: Many of her favorite websites, such as Nick, used plug-ins only available for Windows browsers; increasingly kids games relied on DirectX and other Windows-only tools provided to developers by Microsoft. Sure, plenty of kids games worked on the Mac but many of my daughter’s favorite titles were Windows only. This marked a fairly dramatic change from three years earlier when the majority of games, including the newest, most popular titles, worked on PCs and Macs. But soon after, I had a chance to test the 17-inch flat-panel iMac against Gateway’s Profile 4. I wrote a comparative review and later a separate one on the iMac. But by the end of September, I had put all the Macs away for good. This time I meant it. I would return to using PCs, run Windows XP, cover Microsoft and be happy with the decision. Windows XP just wouldn’t let me do this. Two months after returning to XP, I reached the same point I had many other times following a switch back: Paranoia and frustration. Consistently in my testing, Windows XP proved to be a great OS, particularly during the first few weeks of use on a new computer. But little glitches seemed to pop up the longer XP would be in service and the more applications were installed on the computer. Like many times before, after about two months, I had found a constant string of unrelated, ongoing glitches began to waste my time and increase my frustration level with using Windows XP. Some of the annoyances were just plan crazy. Case in point: I think Windows Media Player 9 Series delivers the best sound of any other digital music player, including Apple’s iTunes 4. But, as is too typical of my experience with Microsoft software, glitches negate the benefits. Following one WMP9 update, one of my favorite features, one for queuing up songs, no longer worked. Other features also got scrambled—and in the same manner on more than one PC. Because Microsoft considers WMP9 a part of the OS, there is no way to uninstall and then reinstall the software. The user must rely on a feature called System Restore to essentially roll back the clock on Windows XP. But the process also removes any other changes to the OS made before the roll back. Security concerns, like who is watching me now, led to paranoid feelings about using Microsoft software. CNET’s public e-mail addresses for news tips and letters get bombarded with lots of messages containing viruses. I would typically see Norton AntiVirus flag anywhere from 10 to 30 viruses a day pouring through these public addresses into my inbox—and those would be the few not caught and killed by CNET servers. I knew the day would come when a new virus for which I had no protection would toast the computer. Far more troubling was the ongoing bizarre behavior I observed with Microsoft Outlook 10. This was consistent on every Windows PC I had used for more than six months and even after trying out Outlook 11 beta. (Microsoft later officially named the product Office Outlook 2003.) Those same public CNET e-mail addresses get spammed like crazy. So I typically mass deleted e-mail. But soon after emptying the Outlook 10 trash, I would see Norton AntiVirus open and scan mysterious outgoing e-mail. These messages would never appear in the Sent folder. Now, they could have been return receipts, but I had turned on the Outlook feature that supposedly blocked return receipts. After adding up these and other security concerns, realistically examining my ongoing frustration with Windows XP and accepting my growing longing for the fun days of using OS X, I again switched back to the Mac in mid-November 2002. Or so I thought. Less than two weeks later, I returned to Windows XP, with a harder determination to switch back to Windows and stay away from the Mac than ever. I cleaned out all the Macs, starting by sending the review units back to Apple. This time, I was determined to stick with Windows XP and forgo the Mac. On Jan. 18, 2003, I once again moved back to the Mac. But this time, with greater angst than ever. One week after that switch, I put away the Macs for good. This time the switch back stuck. I ran only Windows XP PCs, but kept a loaner PowerBook on hand for testing Mac OS X. Strangely, Apple ended that angst on April 28, 2003, with the launch of iTunes 4 and new music service. I switched back to the Mac. Soon after, I took an analyst position at Jupiter Research covering Microsoft. Summer 2003 saw lots of moves to and from Macs or Windows XP PCs. Much of the summer I used a 17-inch PowerBook loaner from Apple. But, during late autumn, I started looking at different digital media formats and portable players; I found, to my seasoned ears, Windows Media Audio to be superior sounding to Apple’s Fairplay-protected Advanced Audio Coding (AAC). Delighted by WMA and increasingly antsy about my responsibilities covering Microsoft, I gave away my Macs around the U.S. Thanksgiving holiday. Then, I bought a HP Media Center m270n and worked with a few PC loaners. I also converted my CD collection to WMA and started using several non-Apple music players. The Windows return brought clarity to my computing life, as I put away Macs forever. But, I missed Macs. The threat of computing Windows viruses and security breaches, ongoing problems running Windows on multiple machines, the missed performance, and elegance of Mac OS X and remembered better joy of using Macs tugged at my psyche. One problem: I really, really, really liked WMA more than AAC, and music is an important reaction. In the end, several overlapping circumstances waffled my position: In January-February 2004, MyDoom ravaged Windows PCs around the globe; I installed a Windows screensaver, which installed multiple adware and spyware programs without my permission; on a trip, I couldn’t listen to songs purchased from a WMA music store because the computer hadn’t been able to authenticate without an Internet connection; etc., etc., etc. 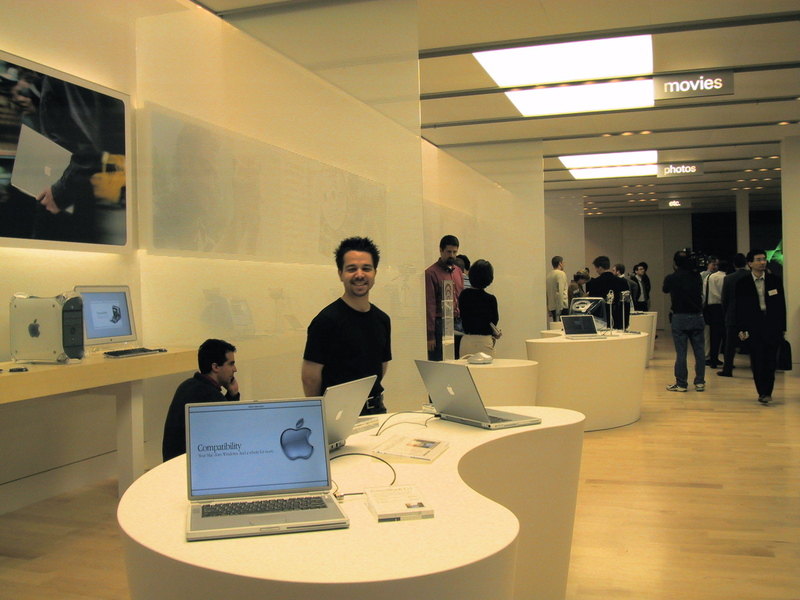 On February 7, 2003, a friend and I took our daughters to Tysons Corner Center in McLean, Va., where is my local Apple Store—the first opened, by the way. There I purchased a 15-inch PowerBook G4, refurbished AirPort base station, Apple Bluetooth wireless mouse, and M-Audio 49-key Radium keyboard. Four days later, I bought my fourth grader a 17-inch iMac from CompUSA. She switched back, too, after working on a Windows Media Center PC for about 14 months. My Mac return is permanent this time around (hopefully). I will continue using Windows daily, because of my work. But, personally, I am a Mac user; with no angst this time. The four days my daughter has used her iMac have been transforming. Rather than watching TV on the Media Center PC, she edits digital photos and movies. She’s gone from mind-numbing to creative computing. Same here.